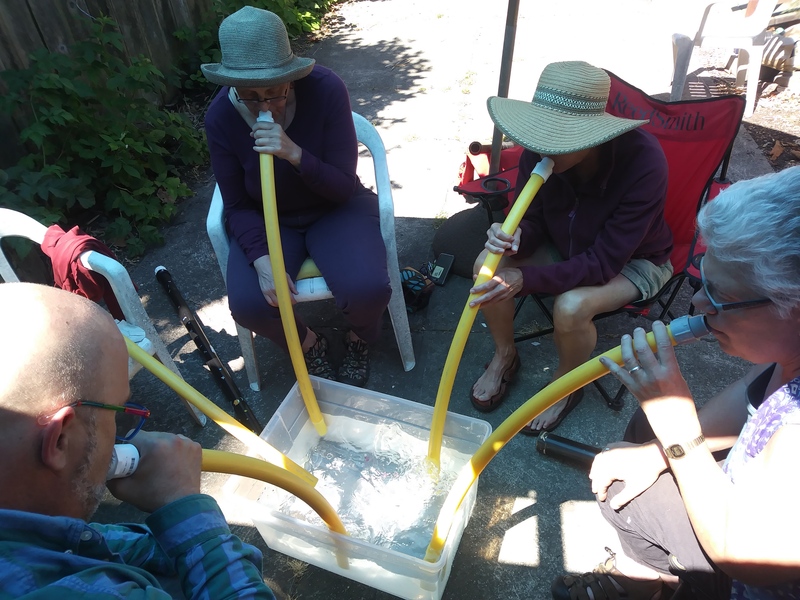 Elise will be leading a free workshop called Breath-Giving Didgeridoo at the SF Free Folk Festival on June 8, 2019 from noon-1:00. Everett Middle School, 450 Church St., SF. See https://sffolkfest.org/ for more details. 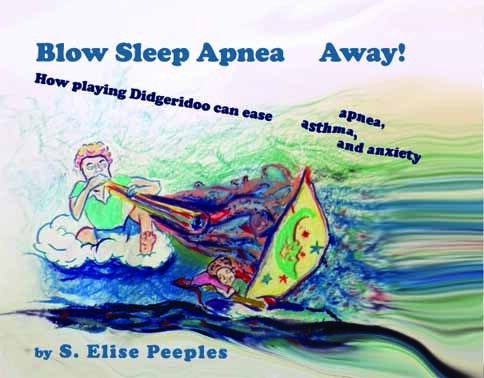 Watch for the release of my soon-to-be-published book, Blow Sleep Apnea Away: Playing Didgeridoo to Ease Apnea, Athsma, Anxiety and More. Six Saturdays starting on March 23 from 10:30-Noon. $120.00 for six classes. E-mail me to register. Please contact me if you would like to be informed of the details of upcoming classes. If you live in the greater Bay Area and would like to host a class near you, contact me and we will see if we can get one started. Click here to see a PDF version of a flyer for a weekend workshop in Eureka, CA on July 17-19th, 2015. If you would like to be on a list to be notified of the next time I will conduct a workshop in Eureka, click here and let me know you would like to be on a list. 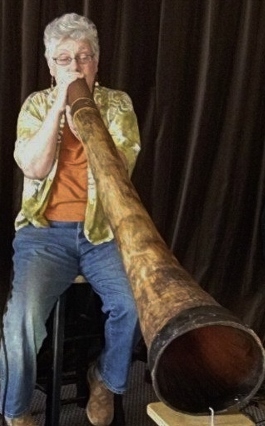 A Didgeridoo is an ancient Australian Aboriginal drone instrument made out of a hollow tube, originally made from Eucalypus limbs hollowed out by termites. A didgeridoo sound can be made from almost any hollow tube including PVC pipe, cardboard tubes, bamboo, agave, or bull whip kelp sea weed. Is your sleep interrupted by sleep apnea, intense snoring and/or insomnia that result in daytime sleepiness? If so, playing a drone instrument called the didgeridoo can help. Get relief from sleep apnea and snoring, express yourself musically and have fun at the same time! Reuters News Service recently reported that a study published by the British Medical Journal (2/4/06) shows that regular didgeridoo playing reduces snoring and daytime sleepiness. Snoring and obstructive sleep apnea syndrome are common sleep disorders caused by the collapse of the upper airways. Reports of didgeridoo players experiencing reduced daytime sleepiness and snoring after practicing led experts in Switzerland to test the theory that training of the upper airways by didgeridoo playing can improve these disorders. They identified 25 patients with moderate obstructive sleep apnea syndrome and who complained about snoring. Patients were randomly allocated to an intervention group (didgeridoo lessons and daily practice at home for four months) or a control group (remained on a waiting list for lessons). Compared with the control group, daytime sleepiness and apnea scores improved significantly in the didgeridoo group. Partners of patients in the didgeridoo group also reported much less sleep disturbance. The authors conclude that regular training of the upper airways by didgeridoo playing reduces daytime sleepiness and snoring in people with moderate obstructive sleep apnea syndrome and also improves the sleep quality of partners. How can you learn the didgeridoo? Elise has been playing the didgeridoo for seven years now and is now offering one-on-one sessions and classes to teach the skills to others. Included in the package is a practice urban didgeridoo, either decorated or one that you can decorate yourself. Should you become interested after you learn how to play, there are many professional didges available in the marketplace. 4.) Provides insight into yourself. and gives you a way to express yourself musically. 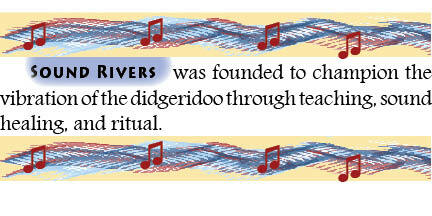 Playing the didgeridoo reminds us of our earthly, indigenous roots. Originally these instruments were played to develop empathy with animals as the sounds of animals, birds and insects can be replicated on the didgeridoo. The didgeridoo seems to bring up energy from the earth itself and make it audible to the human ear. Breathing is connected to the word “spirit” in many languages, including English. And yet so many of us have not learned to breath properly, causing physical as well as spiritual problems. The art of circular breathing that is needed to play the didgeridoo allows us to become conscious of our breathing and to correct problematic patterns that we have established. This special kind of breathing can be of help to anyone with pulmonary problems such as asthma. The Greeks saw the diaphragm as the seat of the soul, using the same word for spirit, soul and diaphragm. Didgeridoo playing is an effective way to train the diaphragm because some of the rhythms are created directly by the diaphragm. Watch an experienced player, and notice the intense activity of the diaphragm. Didgeridoos have been used to reach a relaxed, dream-like state in which the unconscious can be accessed and insights gained. And it gives you all of the benefits of expressing yourself musically. Our events are fundraisers for the Puuya Foundation in Queensland, Australia who work with Aboriginal Australians in a number of exciting programs. Click here to find out more and/or to contribute. We are now listed in Thumbtack.com where you can find and book trustworthy local services. Elise playing her bamboo didgeridoo for Palouse. Class series start periodically throughout the year. Contact Elise if you would like to be on a waiting list for a class. Click here to link to Elise's book When Things Happen to People: The Field Beyond Good and Bad. Click Here to link to The Emperor Has a Body: Body-Politics in the Between.